The only casing stone from the Great Khufu Pyramid of Giza is being displayed on February 8 in the National Museum of Scotland in Edinburgh. This display is the only one of its kind anywhere outside of Egypt. The huge white limestone is being showcased in the newly established “Ancient Egypt Gallery” at the National Museum of Scotland. The Egyptian government described purchasing Egyptian antiquities without the country’s approval as a “crime”. Meanwhile, the Ministry of Foreign Affairs demanded official documents that prove that the stone was legally obtained by the UK. 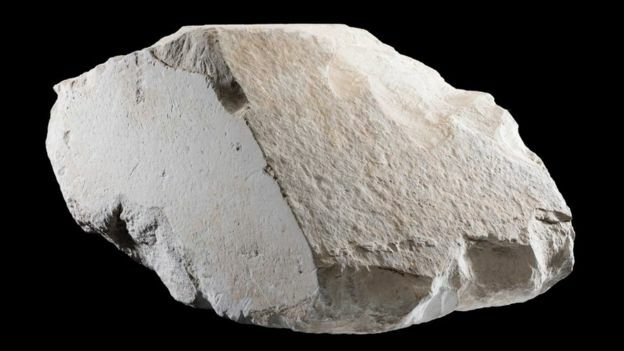 The director of the National Museum of Scotland, Gordon Rintoul, told the Guardian that they sent all the official documents affirming that the museum has owned the stone since 1872. Rintoul insisted that all accusations saying the rare stone was stolen by a Scottish antiquarian are entirely false, stressing how satisfied they are that the stone was not illicitly traded. A spokesman for the Egyptian embassy in London stated that Egypt requested this documentation; however, he disclaimed receiving it, the Guardian officially reported. Regarding the way this stone was brought to the UK in 1872, Ritoul declared that it was rightfully transported by Waynman Dixon, a British engineer. Dixon was on a mission for the Astronomer Royal for Scotland Charles Piazzi Smyth at an archaeological site near the pyramid. Notably, Smyth’s wife Jessie was a geologist known for exclusively conducting an accurately detailed survey of the Great Pyramid in 1865. The stone is an incredible portrayal of how this iconic building once looked. Dating back between 2589-2566 BC, Khufu is the largest and oldest of the three Great Pyramids of Giza, which are included among the world’s seven ancient wonders. Appreciating that it is one of the few surviving casing stones of the Khufu Pyramid, especially after an earthquake in 1303 AD, the rare stone is centralized in a spectacle about the construction and design at the new gallery. This gallery’s inauguration celebrates 200 years since the first ancient Egyptian artifacts were ever delivered to the National Museum of Scotland.